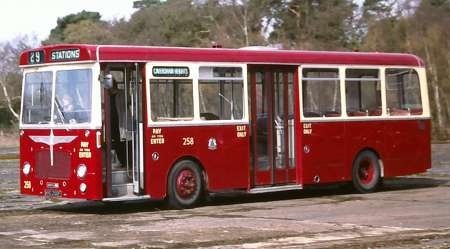 KRD 258F, Reading 258, is another of the operator’s Bristol RELL6G fleet, with Strachans of Hamble B34D body (and the tribute to Burlingham’s "Seagull" motif). She’s seen at Wisley airfield, arriving for the open day there on 4 April 2004. Since the organisers’ move from Cobham to Brooklands, these events are now held at the latter site. When these were delivered they were likened to milk floats by some observers! As an ardent supporter of centre exit buses this seems a grand motor to me, but is it perhaps an optical illusion that it seems very short for a 36 foot vehicle ?? I think it is quite a striking looking bus – enhanced by a good livery. Just wonder about reflections in the windscreens at night – they look very upright and flat in plan view. Apparently Reading were quite enamoured of their Burlingham Reliances and basically wanted the same again. Since Burlingham was no more it fell to Pennine and Strachans to put a modern twist on the original – and this is what they got, along with the "Burlingham" motif on the front. These were probably 32ft 6ins but, for some reason 32ft 9ins sticks in my mind! Can anyone supply a photo of the Pennine version? I assume that they too, were a good copy. Just ferreted out of Simon Butler’s book on the RE that these were, indeed, 33’0" long. Thanks for clarifying the length David. As regards the Birmingham style motif, all Reading single deckers after the Burlingham batch had this or a variation. 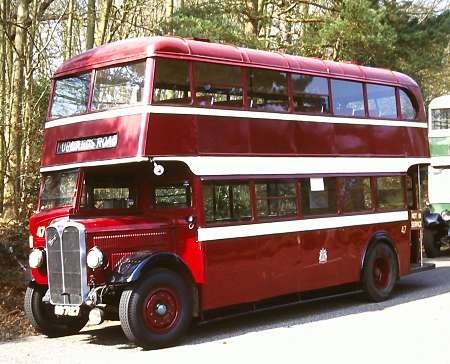 These were built by Duple Northern in Blackpool after Burlingham had been taken over, Neepsend, Strachans and Pennine. Of course Reading also adorned the front panels of its Trolleybuses with additional brightwork. I assume Birmingham is a typo rather than a Freudian slip Phil? It’s the *!"**!! predictive text on my tablet. Keep taking the tablets, Mr Blinkhorn!!!! Until I saw your typo, Phil, I’d not even considered how close Birmingham and Birlingham were! On their home turf we called them "cattle trucks". I though they were very good-looking vehicles, and certainly distinctive. The problem lay not in the buses themselves but in the politics and twisted economics that insulted passengers by forcing them to stand, when car-drivers were being cosseted and effectively subsidised. Ian, I totally agree with your comments regarding the "twisted economics" of forcing passengers to stand while cars (aka the competition) were steadily becoming more comfortable and affordable (and they even had heaters that worked – wowee wow wow!). The term "cattle trucks" describes such buses well, and one dreads to think of the consequences should such a bus have been involved in a head-on collision whilst fully loaded. Your loathing of the word "standee" is interesting, and maybe I can help with an alternative. A few years ago, Burnley & Pendle introduced a fleet of Optare Versas to the townsfolk of Burnley. Instead of being in B&P’s very attractive red and cream however, they were delivered in a new livery of yellow and orange (more akin to mustard and terracotta). Added to this they were adorned with the fleetname ‘Starship’. I have been reliably informed that within a few days of the buses’ introduction, their drivers were becoming tired of passengers tendering their fares and saying "beam me up Scotty!". I did wonder at the time if any standing passengers should therefore be referred to as Klingons? Ian, I agree. Undoubtedly the ‘standees’ would have gazed enviously upon the ‘sitees’. Visions of Klingons and Sitees really made my day! Wonderful how the imagemongers and we-know-besters always unwittingly provide the pins with which to burst the bubble of their own pomposity. Recently a train company (whose fleeting name doesn’t even escape me, as it was totally unmemorable) announced that rather than providing more seats it was considering bumrests for non-sitees to lean against, presumably qualifying these unfortunate travellers as propees–or would that be better spelt proppees? A search led me incidentally to one Tim Leunig, an economist who would love to see Margaret Thatcher’s Serpell Report revived with massive railway closures, and who actively encourages the standing-room-only approach. Watch out for him: he’ll be at (but not ON) the buses next. Sounds like South Eastern Trains – the white ones out to Kent. Interesting Ian – I confess I used to support the standing room only brigade – for the London commuter belt. It seemed a good way to encourage them to look for more congenial places to live and work! Unfortunately, with increasing train speeds, the London commuter belt includes Wiltshire, Lincolnshire and Yorkshire etc. now, so that previously comfortable trains are forced to become sardine tins. Travelling on a Worst Great Western HST in standard class is now like riding in a toastrack. Cross-Country is just as bad, and they don’t even have the excuse of "serving" London commuters! Sorry for rant -let’s get back on topic! I returned to Burnley recently having lived there in the late 1960’s. 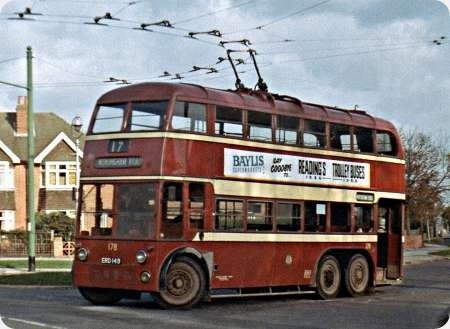 I can remember when Burnley and Pendle was Burnley, Colne and Nelson Joint Transport Committee.My wife and I lived near Queensgate Depot and were often lulled to sleep by the last Tiger Cub running in from Reedley Halt. The strange livery mentioned above is still in use but I must say the revamped bus station is much better than the old one. Very civilised unlike Salisbury where I now live where the bus station has been sold by the asset strippers and the streets are clogged up by parked buses. I used to drive the Reading RE’s from 1973 to 1979,they were my favourite buses in the fleet at the time,the semi – auto gears were a pleasure to drive although the steering was heavy with a full load on.The heating was almost non existent so you froze to death in the winter months. The only visible difference between the Strachan bodied ones and the Pennine bodies. was a bit more silver beading o the sides and front of the Pennine ones.